You’re tired of waiting for content that never arrives. You’re fed up with editing the copy your client finally delivers in an attempt to whittle thousands of words down to the right amount of content for your design. And you’re sick of the scope creep that happens whenever you start working with client generated copy. You’re ready to create the smooth, easy process you’ve been hearing about from Christine. The one that includes really good copy that elevates your work and makes your design pop. But, you’re not sure how to get started. No problem… that’s what this blog post is all about. 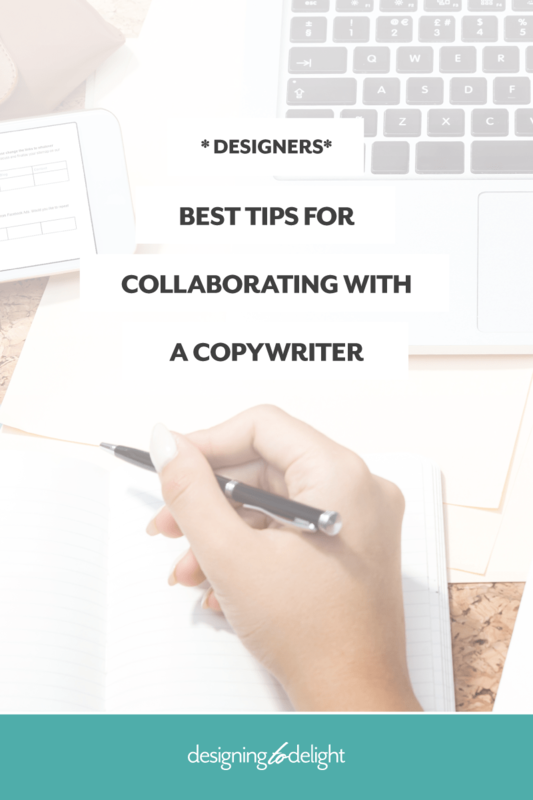 You see, I’ve worked closely with Christine since 2014 and I’m about to give you insight into this whole thing from a copywriting perspective – and share MY tips for good collaboration. Right now you’re motivated by the issues and bottlenecks in your business, and that’s great. But a great collaboration is built on more than your personal ease and success. Both you and your copywriting partner need to be motivated primarily by the quality of the results you deliver to your clients. This might sound obvious, but the average copywriter doesn’t care about your ease as a designer. (She also doesn’t care about your scope or your timeline or your profitability.) She cares about her own business and the problems she struggles with – like client acquisition, referrals, and her own portfolio. A good copywriter knows that excellent design elevates the quality of the words on the page. She knows that a happy client – who gets great results – is good for her business. And if she’s smart, she knows design quality is essential for these results. So – you are coming at the same end goal from different directions. You need great copy to elevate your design. She needs great design to elevate her copy. What’s the intersection here? Quality service to your shared client. Make your client’s needs and experience your primary motivation and you and your copywriting partner will be on the same page. You have a design style and an ideal client. Maybe you work with smart, female service providers or maybe you target the fashion industry or realtors or manufacturing organizations. Your fee for a basic website can be anywhere from $500 – $5000+. These things matter, trust me. Copywriters have similar business models and positioning. Some of us are less experienced (and less expensive) while others have expert status and charge for it. We focus on niches too – everything from health coaches to technology companies to jewelry designers. We have preferred clients and unique writing styles. So – here’s the thing – you’re looking for copywriters who are aligned with the same type of clients as you. Your life coach client with the limited budget deserves a copywriter who is as excited about her business as you are. Close collaboration is a relationship, believe it or not. You need to fit together as friends – or at least professional acquaintances – and you need to feel comfortable being really candid with one another. Christine and I are friends. We vacation together, collaborate on our businesses, and share client information freely and openly. It wasn’t always this way – the relationship has deepened over time. But, we have always felt comfortable communicating and we’ve trusted one another. That’s what you’re looking for…and your gut will let you know when you find it. Does she care about clients the same way I do? Is her work ethic similar to mine? Does she keep her word, meet her deadlines, and communicate openly? See – some clients are challenging. (Just speaking the truth here…) You and your copywriter will need to put your heads together just to survive sometimes. 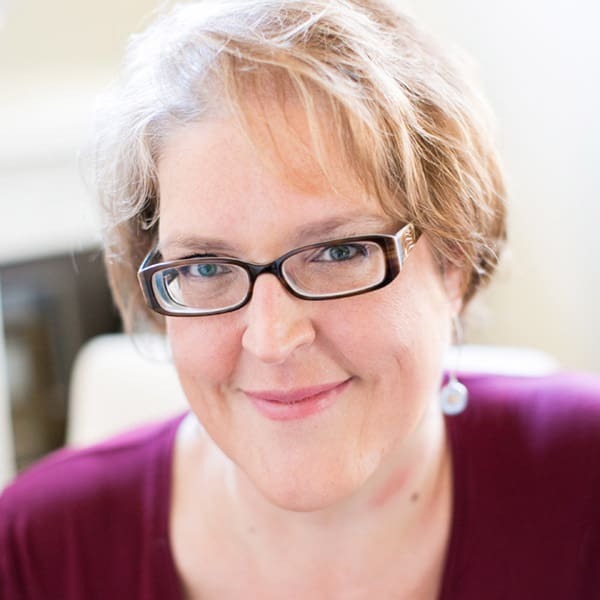 Christine and I have had a few difficult conversations trying to figure out passive aggressive (or just downright aggressive) clients, resolve issues, and clarify things. You need that kind of rapport with the copywriter you’re working with… trust me. True collaboration is an open process. I recommend sharing your stuff openly and asking your copywriting partner to do the same. It’s pretty tough to write copy (especially for the home page) without a few design clues. But when you share your design thoughts and basic discovery with your copywriting partner, everyone benefits. Discuss your process – Early in the collaboration, get on a quick call and share your process (at a high level) with the copywriter. Share your timeline, the way you work, and the way you communicate with your client. 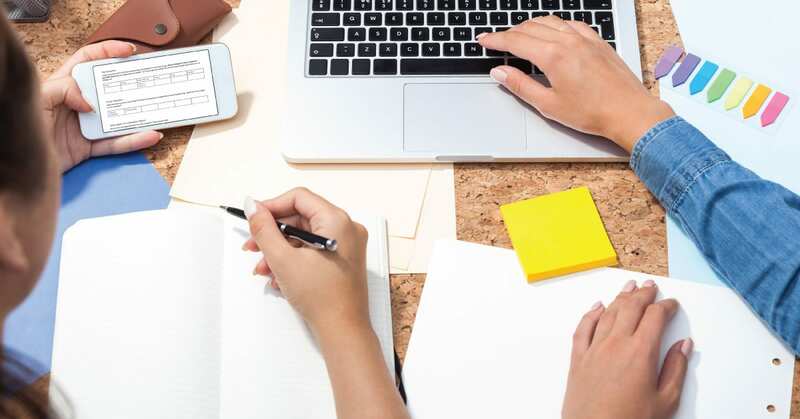 Share discovery information – The information you gather about your client’s business, goals, and preferences is really helpful to a copywriter and sharing it openly will help her do her best work. It will also save the client from having to give the same info more than once. Ask the copywriter to share any of her discovery insights with you as well. Together you’ll get an even more complete picture of the client’s needs. Share the basic site map and homepage wireframe – The pretty stuff doesn’t matter much, but the basic design and digital strategy are essential for creating copy. In order to write copy that fits into your homepage design, a copywriter needs a visual to get an idea of space. Similarly, the site map you’ve planned with your client is a type of road map for content creation. Here’s a little secret… wait for it… clients really don’t understand formatting. They have very little insight on headers and the basic flow of content on a page. But copywriters think in terms of formatted copy. I can’t write something without mentally pulling out headers and points of emphasis. It’s hard-wired into my writing brain…and likely any copywriter you work with will be the same way. So – save us both a lot of time and frustration by sharing how you’d like to receive the content. Let the copywriter create the headings and h tag hierarchy she prefers, and let her bold and italicize all she likes too. You can always adjust fonts or emphasize things visually once the copy is delivered. Take a moment and picture something for me, okay? You deliver a design concept you’re really excited about to your client. You feel this captures the essence of the client’s branding and mission. You’re pretty confident in it, actually, and you’re looking forward to your client’s reaction. But you don’t know she’s shared the concept with her copywriter. The copywriter doesn’t like the concept. It’s too colorful or flourishy or crisp or monochromatic for her… and she lets your client know her thoughts. She shares her opinion of your design choices and stamps all over your intentional branding and style. She influences the client – and not in a good way. Suddenly your work has two critics – the writer and the client. See where I’m going here? Don’t do this… even if you’re tempted! Respect the creative brilliance and freedom of your client’s copywriter. Keep your comments to a minimum when talking to your client about the copy. Instead, give the copywriter direct feedback if you really feel strongly that it’s necessary. Sometimes the content is just too long or too wordy or not properly formatted. Feel free to share those points with the copywriter. At times you might also feel that the design and the message aren’t properly aligned. That’s good info to share. But if you just don’t like it? Keep your mouth shut. Let your client express concerns with the writer directly. Give the writer the same creative freedom you’d prefer to receive from her. These are great tips, but what if my client hires someone I didn’t refer, don’t know, and don’t like? Good question! At the end of the day, your client is the boss. It’s her website, and she can have her cousin’s husband write the copy if she wants. You don’t get to stamp your feet in frustration or anything. Instead, you have the opportunity to model a professional, collaborative relationship for your client. I suggest you reach out to the writer and request a call to discuss scope and formatting. Most copywriters will be receptive to this since the information you share will help them create great copy. Once on the phone, use your most polite and respectful manner to build a strong working relationship with the writer. Be prepared and professional. Set good boundaries. Share your stuff openly. And then hope for the best. You may find a new professional you can confidently refer to other clients. As long as both you and the writer are focused on the client, you’ll be fine.